Though air pollution results in more and more deaths, Kosovars continue to illegally excavate, sell, and burn coal. In the hot summer time, when most people are trying to find a way to keep cool, Valbona Maliqi from Prishtina is already planning how to stay warm through the winter. Preparations for the winter season begin in July and August. In her warehouse, she places several cubic meters of wood alongside piles of coal, which she usually buys at the open market in downtown Prishtina. Though she is aware that burning coal causes air pollution, economic factors drive Valbona’s choices when it comes to heating. “Coal is cheaper, therefore I buy it. I have no other choice,” she tells BIRN, her three children sitting next to her. Valbona says that she buys the coal next to a place known as the ‘Llapi’ mosque, not so far from her house. “I don’t ask where the coal comes from,” she admits, but mentions that one trader told her it was from Zhilivoda, a village located approximately 35 minutes away from the capital, in the municipality of Vushtrri. Fitim also gets his coal from Zhilivoda. The village is located near to the ‘Sibovc’ surface mine and many residents in the area illegally extract coal from private land. Traders visiting the village can buy a cubic meter of coal for around 15 euros, which they can then sell on for between 20 to 25 euros, depending on the buyer and the season. “We get the coal in Zhilivoda. The risk is high because the excavation holes are deep,” Fitim says. 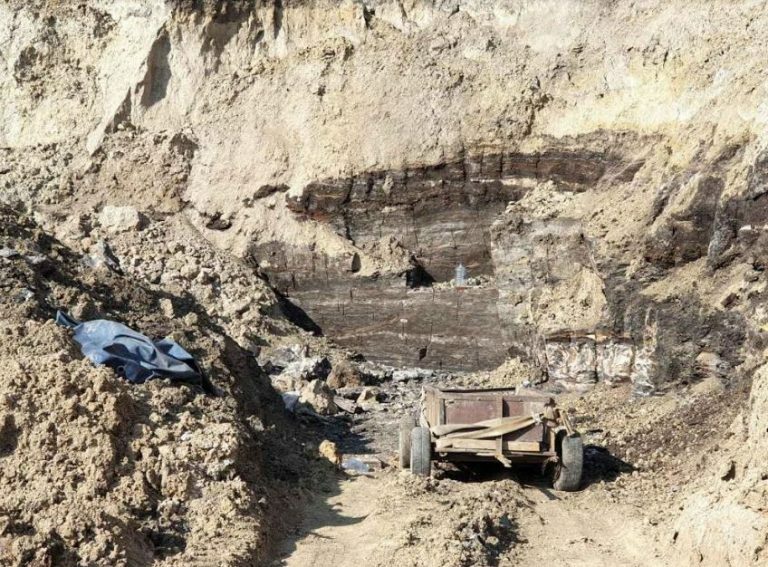 The excavation holes in the village, seen by BIRN, look dangerous and ready to collapse at any moment, and the way in which the holes have been created clearly shows that the coal is being extracted illegally. People in the village refuse to be identified, though are not opposed to BIRN taking a few photographs, which show that the depth of the holes is between roughly four to up to 50 meters deep. Hiding his identity, a local who extracts coal shares the reason why he deals with this dangerous and illegal work. “We have to live. There is no other work to do,” says the man in his twenties. He admits that he himself started engaging with this business just recently. However, his father and brothers have been extracting coal for longer and still continue to do so. Within a day, he earns around 20 euros from the coal he sells. “We sell the coal in sacks to kebab shops,” says the young man from Zhilivoda. “We do this job whenever the weather looks good.” Bad weather, he adds, can lead to the soil drifting into a landslide, collapsing the makeshift mine. Difficult economic circumstances across Kosovo have extended the chain of illegal coal trading, and Zhilivoda is just one of many places in Kosovo where coal is extracted and then sold across different cities. There are similar sites in the villages of Polac, near the town of Skenderaj, and Hade, in Obiliq, where trade is being done in almost exactly the same way. Fitim sells coal for heating in Prishtina, transporting it with a truck. “We do not have any other place to go,” he says, claiming that his job is illegal. He points to cases when inspectors from the Independent Commission for Mines and Minerals, ICMM, alongside the police, seized his coal, forcing him to return it to Kosova Thengjilli Sh.A. – an arm of the Kosovo Energy Corporation, KEK, which dries the coal that is then burnt to generate power. 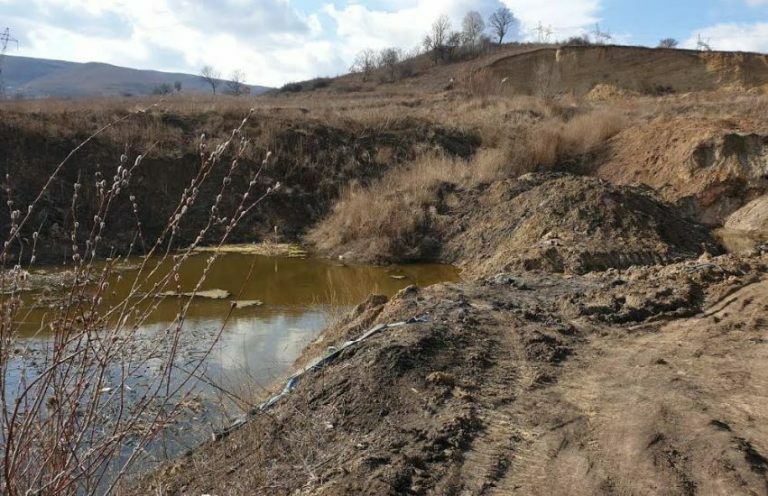 In October 2018, the Ministry of Environment and Spatial Planning, MESP, supported by the police and other relevant institutions, began to confiscate coal in an attempt to prevent air pollution. The MESP has warned the public about the risk of polluted air as a result of coal burning, a warning it repeated in a written response to BIRN. So far, 109 mandatory fines have been imposed, and 15 trucks have been confiscated, with the coal sent to the ‘Kosovo A’ Power Plant. But the MESP does not give any explanation as to how much the fines imposed amount to, and while the amount of coal seized is relatively large, no accurate data on exactly how much it totals to has been shared. It also appears that the campaign is not entirely convincing to many involved in the trade, from the salesmen to the customers. “We used coal for heating our entire life, but nothing happened to us,” Fitim says. With a monthly household income of 700 euros, using coal for heating is cheaper for this family, and they have chosen to heat their house with coal for the last five winters. Currently, the price for one cubic meter of wood is over 35 euros, while a ton of pellets is over 200 euros. A cubic meter of coal is just 25 euros or, as the traders say, 200 euros per truck. As well as at the market, coal in Kosovo is also sold in other, even simpler ways. One method is via the internet, where sellers advertise their products, including via the website Merrjep.com. Posing as a potential customer from Vushtrri, BIRN contact one user who introduces himself as a coal seller. The seller says that he digs out the coal from his own private land and guarantees its quality. “I do not go out in the market to sell the coal. I keep it at home, in sacks,” he tells BIRN, in response to a question about how he sells his product. He adds that transportation of the coal carries an additional fee. “If the buyer comes to my house to buy the coal, the sack is 1.5 euros. If he wants me to bring it, it will cost him 2 euros,” says the seller, whose details, including the conversation, are recorded by BIRN. With the ongoing selling and burning of coal, air pollution continues to be a major issue. In Kosovo’s capital, the level of pollution during winter is constantly high; an air pollution monitor set up by the U.S. Embassy in Prishtina often gives readings which places the city amongst those with the worst levels of air quality globally. In response, Kosovo’s institutions have established a Task Force within the MESP, which aims to improve the situation. The Task Force has banned the use of coal in public institutions, including schools and kindergartens. However, its burning in households still continues. In order to improve the situation, investment in the expansion of the ‘Termokos’ co-generation network in Pristina is continuing further. Co-generation is the use of the steam emitted by KEK during its coal based electricity production. But currently only some of the apartment blocks in certain neighborhoods in Prishtina can be heated in this way, while around 100 private homes are also connected to the system. The rest of the city is not connected to the Termokos network, but officials from the public enterprise say that network expansion will eventually solve the problem of heat supply and eliminate potential polluters. “From the next heating season, with the donations provided by the European Commission and KfW Bank (formerly known as KfW Bankengruppe), we will start joining dozens of residential heating facilities,” says Aferdita Uka, a spokeswoman for Termokos. According to Uka, the expansion will include some buildings near ‘B Street’ in the Kalabria neighborhood, and some other facilities in the ‘Centrum’ and ‘Ulpiana’, neighborhoods. However, the inclusion of more buildings in the steam heating system takes time and until then, many households in Prishtina will continue to use coal. 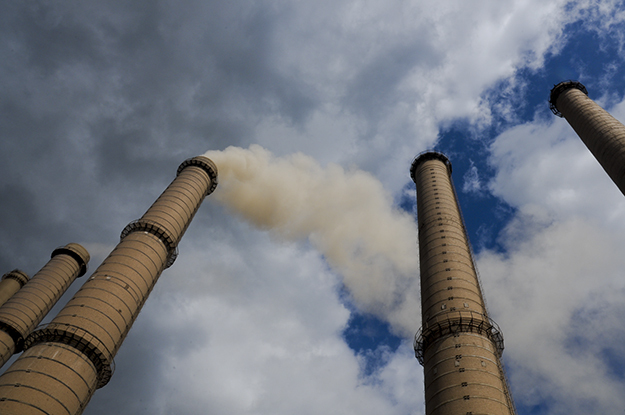 The Ministry of Economic Development, MED, is also monitoring the situation, with minister Valdrin Lluka having previously said that burning coal is a major air pollutant. “KEK contributes to the pollution of Prishtina with eight to ten per cent of all pollution,” he states in a Facebook post from January 30, 2018, when a major debate erupted about air pollution. In the same post, Lluka also claims that the ‘Kosovo B’ power plant is more polluting than the ‘Kosovo A’ power plant, despite the fact that the latter is older. The minister argues that the filters at Kosovo A were replaced in 2011, while the filters of ‘Kosovo B’ have not been replaced since 1985. Officials from KEK disagree with the minister’s claim. Concerning the environmental issue, KEK states that it is in full coordination with its shareholder (the Government of Kosovo) and with the measures undertaken by the MESP. “KEK is only responsible for supplying coal to two power plants,” KEK officials state in their responses to BIRN. However, they do not directly comment on Lluka’s statement regarding the age of the filters at the two power plants. In such a situation, all eyes are turned in the direction of the weather forecast. Even ministers do the same thing, including Lluka. He says the good fortune of Prishtina’s citizens is that, most of the time, air currents mean KEK’s emissions mostly go in the opposite direction to the capital. Lawsuits are also not uncommon in this area. According to data from the Environmental Protection Agency, in 2016 alone over 500 lawsuits were filed against businesses on the basis of environmental contamination. However, the court has taken measures in only 20 of these lawsuits. Decisions to improve air quality take a lot of time to implement. However, death has no time to lose with the number of deaths as a result of polluted air continuing to increase, as is reflected in data from the European Environment Agency, EEA. The latest EEA report, “Air Quality in Europe 2018,” shows that in a country of 1.8 million, Kosovo had 3,700 deaths caused by polluted air in 2015. Compared to its population, the report lists Kosovo as the country in Europe with the largest problem in this regard, with deaths caused by polluted air accounting for 0.2 percent of the death toll in the country. For comparison, in Serbia this indicator is 0.18 percent, with around 13,000 deaths in a country with a population four times larger than that of Kosovo. While this percentage places Kosovo’s northern neighbor at second highest on the list, its southern neighbor, North Macedonia, is in third with 0.14 percent of deaths caused by polluted air. Reports on this issue are usually published years later due to their complexity. One such report, published by the National Institute of Public Health of Kosovo, states that the number of deaths from respiratory illnesses in 2015 was 227 or about 13 deaths per 100,000 inhabitants, a number based on recorded deaths. In the report, the National Institute of Public Health of Kosovo has noted that health is closely related to air quality and the presence of different pollutants poses a potential threat to human health and the environment. The Institute recommends a reduction in the use of private vehicles, more use of public transport, the prevention of combustion of waste and the inclusion of as many buildings in the central heating system as some key steps for reducing air pollution. Even the World Health Organization, WHO, has warned about Kosovo’s air pollution, stating that Kosovo is a vulnerable country. The WHO has stated several times that the biggest air polluters in Kosovo are the two power plants Kosova A and Kosova B. In addition, these two corporations employ around 5,000 people and for many years, most employees have received coal from the corporation to use for heating. This phenomenon was banned in 2019 for the first time in recent years, by a decision issued by the MED. In another measure taken to reduce air pollution, it is intended that the Ministry of Infrastructure and Transport, MIT, continues its engagement in the implementation of guidance on the control of vehicle emissions during the technical control of vehicles. From the beginning of 2019, the MESP will also impose bans and erect signs strictly prohibiting the excavation of coal in certain areas, while the Police, according to the MESP, will assist the ICMM to bring to an end the exploitation and sale of coal, as foreseen by the Law on Mines. In response to this situation, the ICMM states that it has undertaken joint actions regarding the identification and stopping of the illegal trade in coal, alongside MESP inspectors, municipal inspectors and the Kosovo Police. In particular, the ICMM tell BIRN that documents have been sent to mayors across Kosovo, including the mayor of Obiliq, explaining that the extraction and use of coal by citizens in private is illegal. According to the MESP, the mobilization of municipalities is crucial in the battle against air pollution, and action plans for reducing pollution should be drafted at the local level. Legal steps have also been taken in order to create an environmental police force, with MESP officials stating that this new body will tackle potential environmental crimes. However, not even the officials at the Ministry seem particularly optimistic about resolving this issue, as they state that air pollution has been a continual problem in the post war age, and that no quick results are expected. In Zhilivoda, those who dig out coal from the fields say that many years have passed since there was any state official, either police officers or inspectors, that have come to stop the work. On the way to Zhilivoda, there is no sign showing the name of the village, and excavation and the illegal coal trade continues as usual. “I come here, I get coal and with what I get from this sale I take care of my family of eight,” says a trader who was present on the day BIRN visited a private mine in Zhilivoda. He says that he buys the coal there and then sells it in the market at a slightly higher price, confirming that so far no one has fined or stopped him. However, he knows that if he gets caught by the inspectors or the police, all his hard work will have been wasted. “I know that if they stop me, they will take the coal, confiscate it, and all my efforts will have been in vain,” the man from Vushtrri says.